Jean-Claude Biver! If you are familiar with the Swiss watch industry, it is almost impossible that you have not heard of this man’s name before. He is certainly the one of the most prominent figures when it comes to Hublot’s journey and also some other important brands. Although i go hot all over every time i see him with his blazer jacket that he doesn't take off no matter if it's winter or summer i symphatize him because of his success with Hublot. Of course there are some people who state exactly the opposite, and they are a little bit right of course. Eventually, we are talking about Hublot, the brand that creates millions of versions of one model under the label of “limited edition”. Consequently, limited editions do not differ from mass production models. Well, F1 Series is a little bit more limited than their other limited editions. 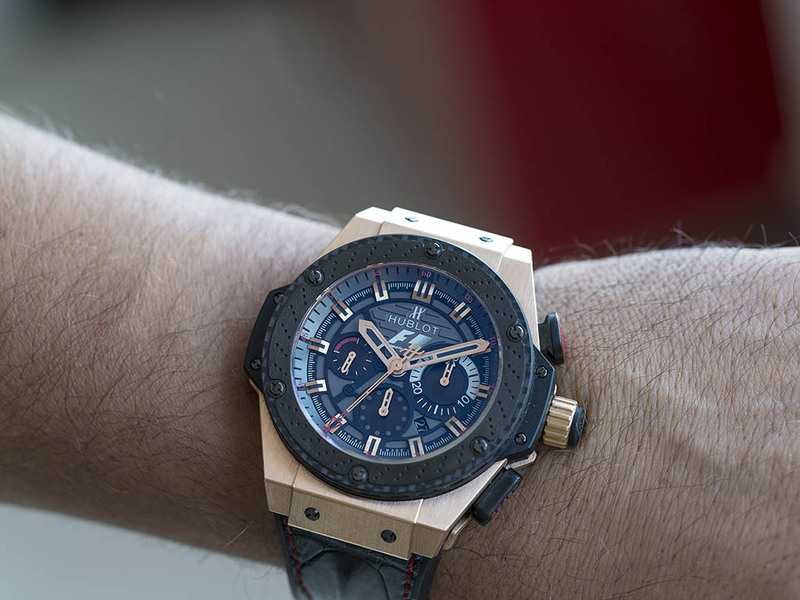 Hublot, is very close to F1 racing, and to motorsports in general. But the connection to F1 series I find the most interesting. 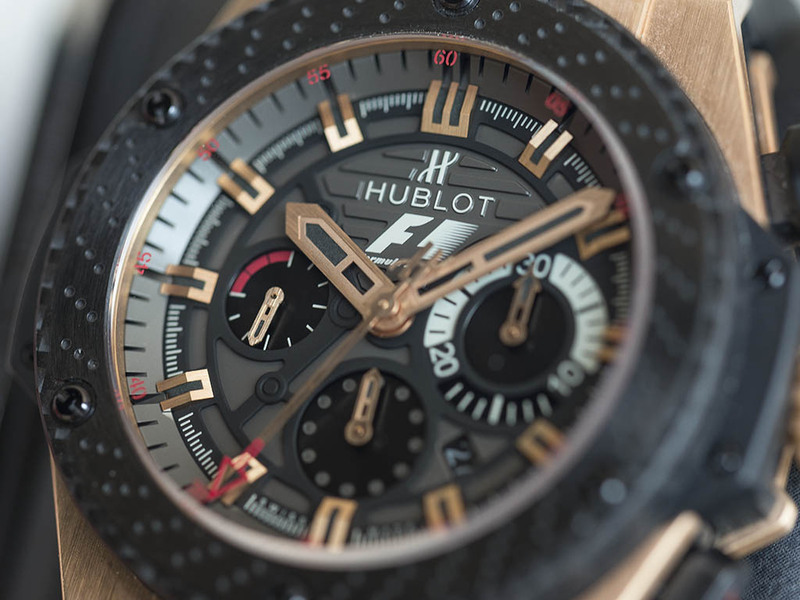 The watch we got our hands on today shows a lot of details and care that prove Hublot’s connection to Formula 1. We are talking about a gigantic 48mm. As gold is involved too, the show becomes inevitable. Yes, if you are going to a club with this watch, your do not have to show off your garage. There are probably some loud Italians laying around… The case’s material is called King Gold. 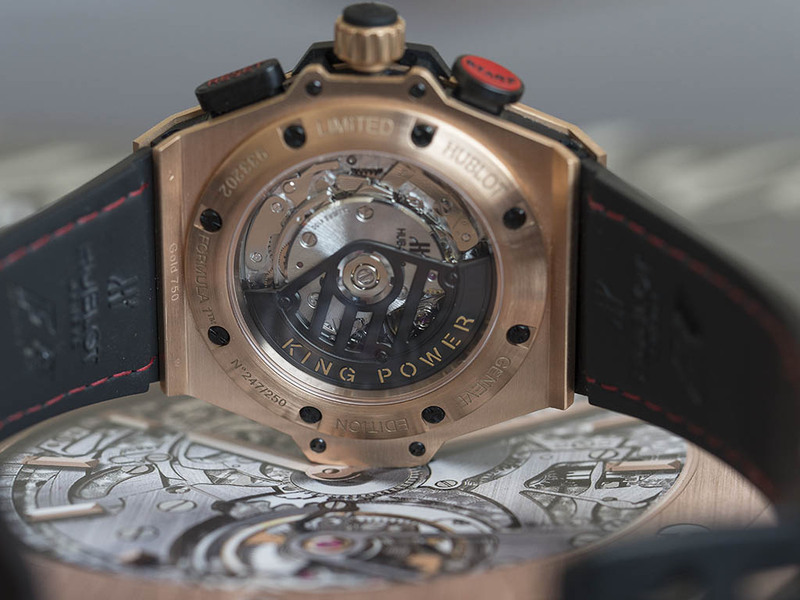 Well, it was designed to fit a king and it features Hublot’s special interpretation of rose gold. Workmanship and details around the case are outstanding; the bezel alone could be analyzed in pages. You will find a ceramic layer added on a carbon fiber base. The ceramic part is inspired by motorsports and is designed as a racecar’s air-conditioned brake discs. 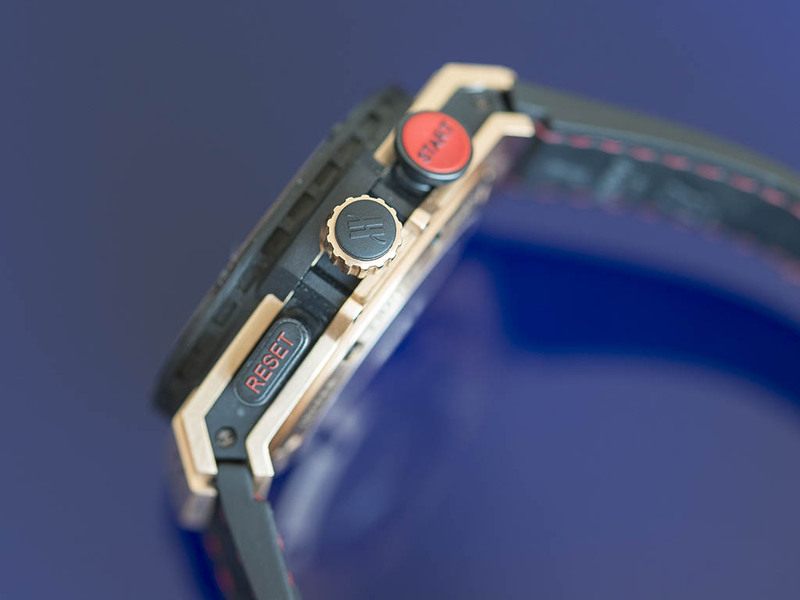 You will see the usual H shaped screws around the bezel. While some complain about the screws not being in line, it will certainly not bother once the watch is on the wrist. Chronograph buttons absolutely support the watch’s sportive character, same applies for its energetic dial, which is perfect harmony with its overall character. The different sized chronograph sub-dials also add a little funkiness to this piece. 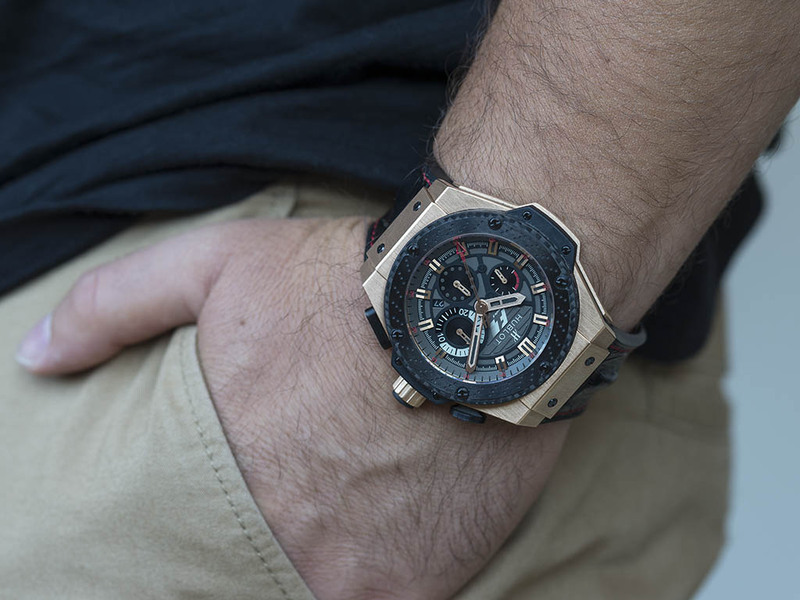 The case is angled on both ends, which is one of Hublot’s most iconic features and makes their watches sit quite nicely on all wrist sizes. Still, it can cause a little inconvenience on smaller wrists. The front and back glasses are made out of sapphire crystal. The front glass is coated with AR material on both sides. Reflections are blocked but it is easy to scratch the AR coating and from there, there is no turning back, one has to be careful. The watch offers enough water resistance for its category, namely 100meters. While it is not for diving, you will not have to run away from water. “When you turn the watch over a great mechanism welcomes you!” would be the words that you would expect me to say. In fact it is Hublot’s caliber 4100 which means ETA Valjoux 7753 that is welcoming you. The automatic caliber offers 42 hours power reserve. 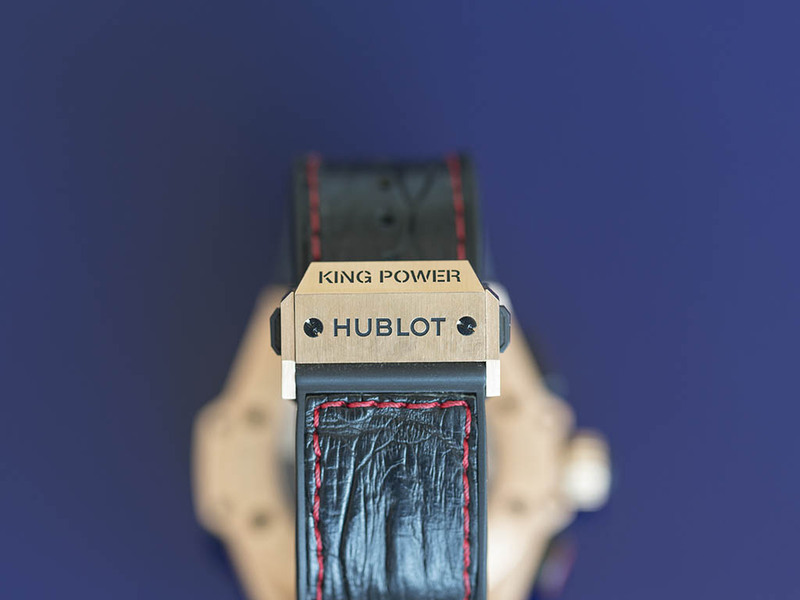 I got confused, why did a brand like Hublot use such standard caliber in such a high-end watch. Of course ETA is a very successful and reliable company in their field, they produce firm, simple, and purposeful mechanisms but here we’re talking about a high level brand’s higher level model. Service easement and spare part abundance should not be the advantage for this kind of watch. After all, if we think in a goal-oriented way the caliber gets a passing-grade from us. The stiff but solid chronograph buttons can be considered ETA classics. By the way in newer models Hublot switched to in-house UNICO mechanisms. The screws around the back cover are detailed and are just like on the bezel. The watch’s strap feels pretty comfortable and special. 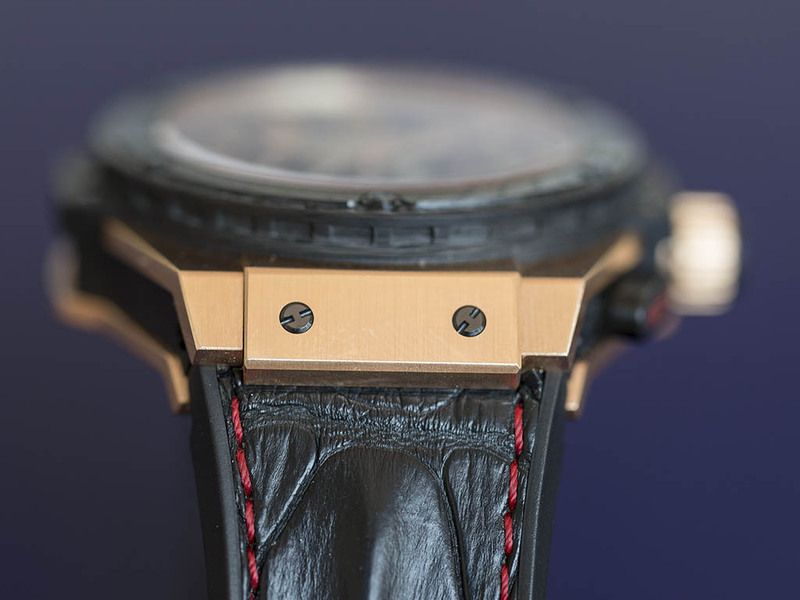 The crocodile leather’s inside is covered with rubber in order to decrease friction and irritation and the red stitching compliments the watch’s look quite well. Its folding buckle is made out of a massive piece of gold and offers both safety and maximum comfort. Changing the strap is not as easy as on the new models, for this one we have to use a special strap that attaches to the case with the two screws. 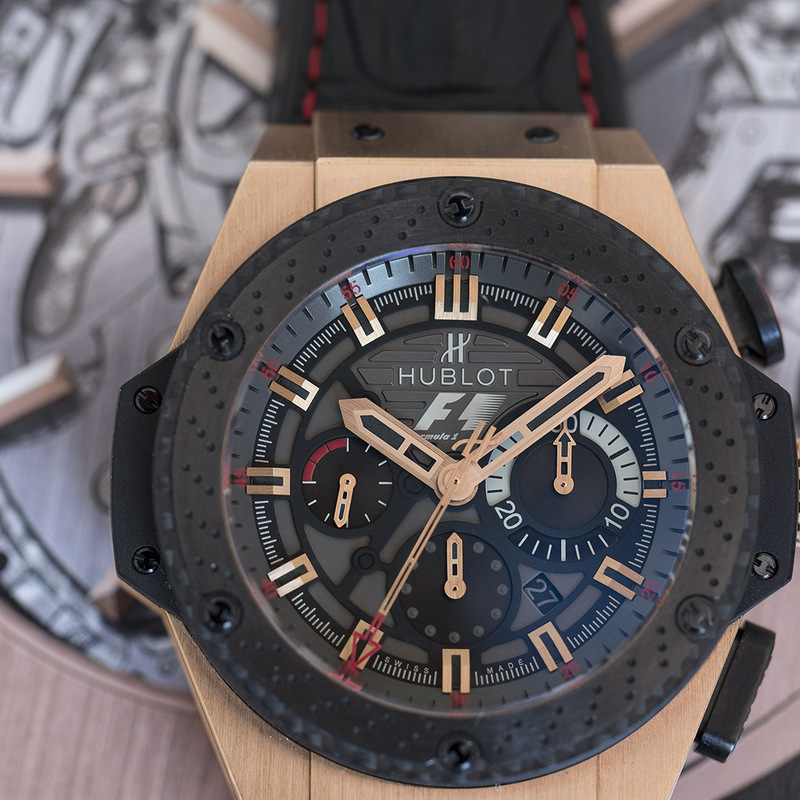 Hublot’s F1 King Power series covers special models that are manufactured in limited numbers. This King Gold version is limited to 250 pieces. 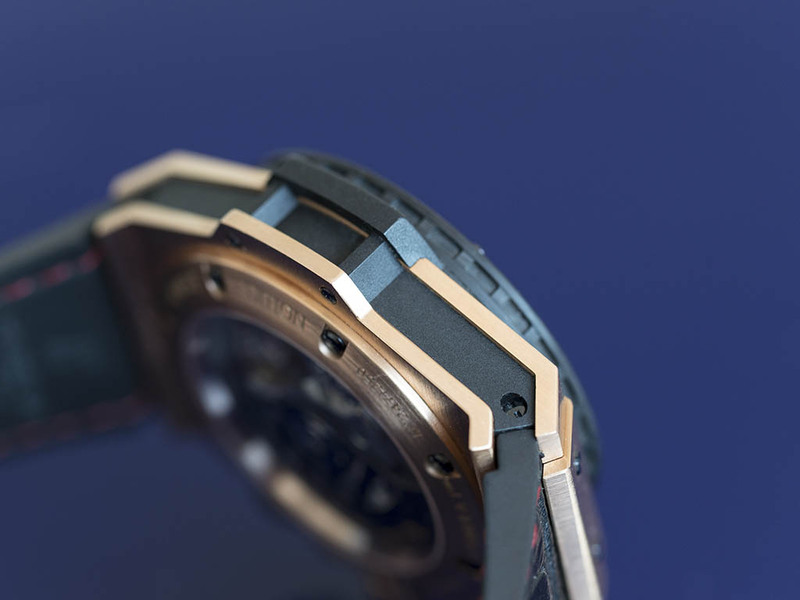 Although we consider this a low number and got the impression that the watch will be very rare, because of Hublot’s aggressive marketing (which we mentioned above) this expectation will probably not be realistic. Good news for those who are looking for this special model.